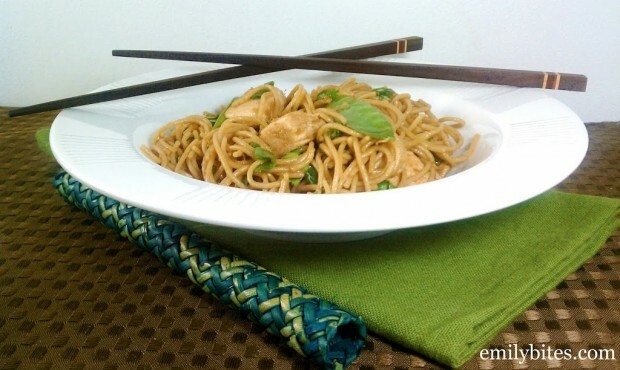 This is a really simple and delicious Asian dish you can prepare quickly at home for a weeknight meal you feel great about. The sauce is fabulous: spicy, savory, a little nutty from the sesame oil, a little sweet from the honey. It’s got a taste of everything. The snow peas give a nice crunch to the dish and scallions and cilantro add some freshness. This meal comes together very quickly and tastes like it took a lot more effort. That’s my definition of a perfect weeknight dinner! Boil salted water in a large pot and cook the spaghetti al dente according to package directions. When the spaghetti goes in, mist a skillet with cooking spray and add the garlic and snow peas. Bring over medium heat and cook, stirring occasionally, for a few minutes until garlic is fragrant and snow peas are softer, yet still firm enough to crunch. Combine the ginger, vinegar, soy sauce, canola oil, water, sesame oil, sriracha and honey in a small bowl and stir to combine. When the spaghetti is cooked, transfer to a colander to drain and then pour the spaghetti back into the pot. Add the chopped chicken pieces and snow peas/garlic. Pour the prepared sauce from step three over the spaghetti and stir until coated. Add the scallions and cilantro and stir in. Serve immediately. This looks delicious! Except I would just swap out the chicken for tofu because I’m a vegetarian. 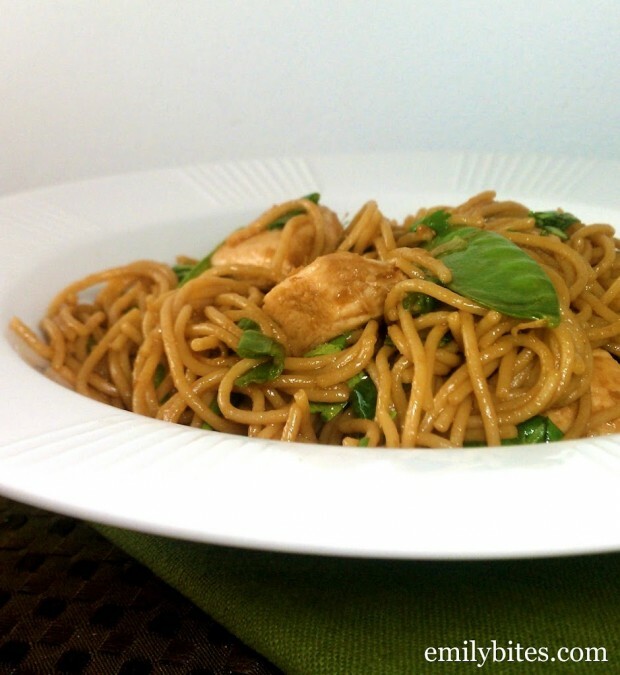 I’m always looking for quick week night dinners. This is awesome! I can’t wait to give this a try. Thank you! Thanks! I hope it’s a hit! I made this tonight and it came out AWESOME! I subbed broccoli because I didnt have snow peas and it was excellent! Spicy and flavorful. Thanks Emily! Love the looks of your version with the snow peas! So glad you enjoyed it. Oh, yum! I love sesame noodles! Me too! These ones were really good. I wanted to eat those bang bang shrimp right off your page today, Lisa, and I am not even usually a seafood fan. YUM. Good evening Ms. Emily, Well, it’s been another “Emily” day around here! I made the taco cheesy pasta for lunch, it so rocked!!! 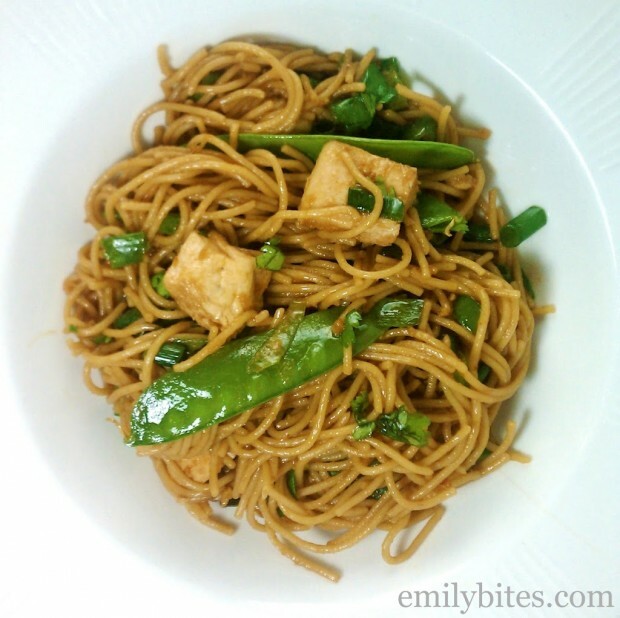 I made Spicy Sesame noodles w/chicken ( subbed the snow peas for broccoli) all I can say is OMGoodness! It was incredible!! Last week, when I did “Emily” day, I made double pizza sauce, made the other one over the weekend! It was great having it again! I made the taco cupcakes, doubled the meat…so tomorrow, guess what’s for lunch tomorrow?! The other half, YUMMY!! I’ve enjoy, I should say…we’ve…enjoyed them so much, that when I went to the store over the weekend….my list was made from your recipes, I see many “Emily” days in my future! Thank you so very much, you’ve made keeping to my points, t WAY easier…plus, WAY YUMMIER!!! This was great! I added in mushrooms & red pepper to add some more color (and veggies) and topped with toasted sesame seeds which I think finished it! Thanks for all you do. Braggs liquid seasoning is a great sub for soy sauce with waaaay less sodium. Works in all sorts of recipes. I always just use reduced sodium soy sauce, but thanks for the tip! This was amazing!!!! I loved the spicy kick it had too. Happy you loved it, Jessie! Made this tonight and loved it! Thanks so much for your weight watcher friendly recipes! Thanks, Jessica – glad you liked it! Thanks Phyllis! Mushrooms and water chestnuts sound like yummy add ins. I’m happy you loved this one! Soooo good! Spicy! Used the broccoli as suggested since I couldn’t get fresh snow peas. Another hit in our house, hubby approved. I made this last night and both my husband and I LOVED it!! It was just spicy enough and the flavor was amazing. After 8 months and 52 pounds, your blog has been a lifesaver. Thank you! I made your chicken eggrolls tonight and was in need of a side dish. I decided to make this sans chicken as a side. OMG, delicious!!! can you also serve it cold? I love this recipe so much!!! I find myself going back to it over and over!!! I use the sauce for other stir fry swell! I add edamame for extra protein and whatever veggies I have to use up! I also can’t resist adding some toasted sesame seeds for garnish! Even my KD and chicken finger eating picky boyfriend loves this! We use quite a few of your recipes in our regular rotations! You are amazing!! Never stop creating such awesome delicious recipe for us!!! Aw, thanks Veronica :). I’m so glad you both love it! WOW! So fast and easy! And super yummy. Slowly, but surely making my way through your site and just love everything I have tried so far. Love the previous poster’s suggestion of adding mushrooms and water chestnuts. I’m totally doing that next time. Thanks Emily! My tummy can’t tolerate anything extremely hot/spicy, so I have to leave out the siracha & cut down the cilantro. Is there anything I can substitute for a little heat instead? I love Asian food but can’t tolerate spice since my gastric bypass. Looking forward to making this & your wonton cupcakes. Thanks! This was absolutely fantastic! Thank you so much for the recipe!